Live in a high-theft area? Burglar alarms not always required. Up to £750 for replacment security features following theft of keys. 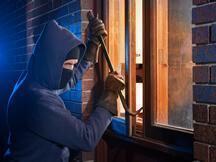 Often the most trendy and wealthy residential areas are those targeted by burglars. Homes in these areas, thieves assume, contain a lot of jewellery, gadgets, antiques, artwork and other desirable valuables. If you live in a postcode with a high theft rate you’ll probably find it difficult to find suitable home insurance. Mainstream insurance companies will either refuse to provide a quote or quote a very expensive price with a very long list of exclusions and conditions. However, HomeProtect can help you. Average claim – theft of belongings and buildings damage caused by burglary: £1,850. Average claim – theft of bicycles: £550. Average claim – theft of itemised valuables from home: £715. This information relates to average claims resulting from forcible entry into the property and theft of belongings (data from theft claims raised by HomeProtect customers 2012-2015). But some of our customers have had the misfortune of being burgled and having the buildings badly damaged and the majority of their belongings stolen, costing thousands of pounds to replace! With the right policy in place, HomeProtect will be there to help pick up the pieces if this happens to you. Learn how to keep burglars at bay with these easy-to-implement tips. Fitting secure locks to your main external doors (5 lever deadlocks conforming to BS3621). Fitting key operated window locks on all windows. Investing in a safe and storing your jewellery and other small valuables in there at all times. Install a monitored alarm at the property. Install security lighting at vulnerable points around the property. Request a property security audit, either contact your local police station or a private security firm who will recommend any other steps you specifically need to take at your property to deter thieves. Can I get contents insurance if I life in a high theft area? Do I live in a high theft area? You are probably aware of whether the area or even the street you live in is a high theft area! Homes in wealthy areas are often targeted more than those deprived areas due to the value of the items they are likely to contain, especially in the run-up to Christmas. And be aware that having a luxury car on your drive can make your home – as well as the car itself – a target. There are a lot of statistics available on the Government’s data hub where you can look up data on different types of crime where you live. You can also get specific crime statistics – including burglary – here. Note: At HomeProtect we use a range of data when calculating premiums and our assessment of risk may vary from that you can find in Government data when calculating premiums online. Will my home insurance cost more if I live in a high theft area? Your home insurance premium depends on a large number of factors including the value of your contents, the types of locks on your doors, whether your home is occupied during the day, and also where it is. If you live in an area which has an above-average burglary rate, then your premium is likely to be higher that it would be for an otherwise identical situation in a low-theft area. Am I covered if I don’t have an alarm? Where we require you to have an alarm because you live in a high theft area, there will be an endorsement that states you need to fit one within 30 days of the start of the policy. If this endorsement is included on your policy, you will only be covered for theft after this period if you have had an alarm fitted and it is in use. We needed a very specific policy which Home Protect provided at a reasonable price. Other providers either did not offer a solution at all or were very expensive.